Clark Masts is a pioneer of the air operated portable telescopic mast, producing their first portable masts (the PT series) back in 1957. For many applications Clark Masts pneumatic mast system of extension has a lot of useful advantages. 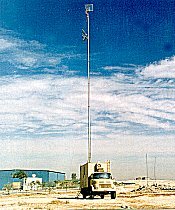 Unlike hydraulic masts, Clark Masts portable masts are light (aluminium-alloy construction), they use a working fluid (air) which is also light, does not have to be carried as part of the mast (unlike heavy hydraulic systems), and if leakage occurs, the Clark Masts portable mast remains clean. Clark Masts' over 62 years experience in manufacturing air operated portable masts allows them to offer the widest choice of models (over 200 different models are currently available) and the best engineered detail at a price to suit most budgets, as a glance through Portable Masts Australia Pty Ltd' online Clark Masts Portable Telescopic Mast Catalogue will show. Alternatively, if you have a requirement that a standard model Clark Masts portable mast will not satisfy, then please take advantage, through Portable Masts Australia Pty Ltd, of Clark Masts in-house mast design facility which can tailor a mast to suit a specific application. 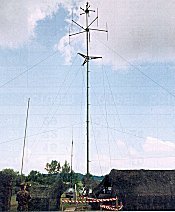 Some of these applications include their use as Aerial Photography Masts, Antenna Masts, Security Camera Masts, Photo Masts, Portable Antenna Masts, DGPS Masts, Aerial Masts, Telescoping Mast, Survey Masts, Portable Poles, Fire and Rescue Masts, Pump Up Masts, Portable Towers, Pneumatic Masts, Emergency Masts, Lighting Masts, Meteorological Masts, Instrument Masts and Poles, Radio Masts, Emergency Services Masts, Vehicle Mounted Masts, Trailer Mounted Masts, Portable Poles, SES Masts, CFA Masts, CFS Masts, RFS Masts, Air Operated Masts and Poles, Communications Masts, Telescopic Mast, Cellular Masts, Radio Survey Masts, Police Masts, ILS Masts, Fire Brigade Masts, Microwave Masts, Outside Broadcast (OB) Masts, Surveillance Masts, Telescopic Masts Military Masts and Alloy Masts. Clark Masts, through their Australian/Asia-Pacific distributors, Portable Masts Australia Pty Ltd, also offer an on going supply of portable mast spare parts, in fact Portable Masts Australia Pty Ltd are still supplying spares for Clark Masts portable telescopic masts made back in 1963! Portable Masts Australia Pty Ltd are Clark Masts Australian/Asia-Pacific direct factory distributor and service agent for Commercial, Military portable telescopic masts, Tekmast and Teklite portable emergency lighting telescopic masts, offering a quick response to any inquiries you may have, large or small. Portable Masts Australia Pty Ltd, located in Queensland, Australia, can be contacted by E-mail at: PMA or Phone 61 402130692, Mob 0402130692. Portable Masts Australia Pty Ltd full address details are shown below. Introduction General information and introduction to Clark Masts air-operated portable telescopic masts. Overview on all models in each series, including details of extended height, retracted height and headload capability. Low cost portable masts with 101 different uses, Headload capabilities from 4.5 to 22.5 Kg and extended Heights of 3, 4, 5, 6, 7, 8, 9, 10, 12, 13 and 15 metres. Short 2 to 3 week deliveries. Uses 63 (2.5"), 76 (3") and 88.9 (3.5")mm diameter base tubes. Now 84 different models available. PDF Brochure on QT Series masts. Series Heavy Duty QT portable masts with headload capabilities from 10 to 30 Kg and heights from 2.92 to 10 metres. Collars designed to allow headload rotation while locked. headload capability. FT masts will accommodate headloads up to 20 Kg. PDF Brochure on FT Series Tripod masts. PDF Brochure on FT RM Series Tripod masts. ST Series Small portable mast series ruggedly constructed, Headloads up to 10 Kg and extended heights to 12 metres. Keyed mast sections. Uses 76 mm (3") diameter base tubes. 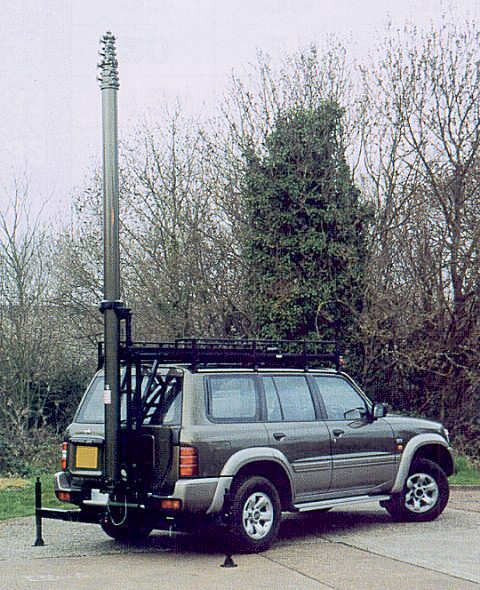 DAF Series Self-contained easily handled lightweight field mountable portable mast kits based on the ST Series masts. 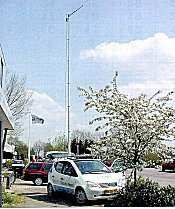 MT Series Medium Duty MT portable masts with headload capabilities from 10 to 20 Kg and heights from 6 to 16 metres. Compact retracted to extended height. Uses 101 mm (4") diameter base tubes. 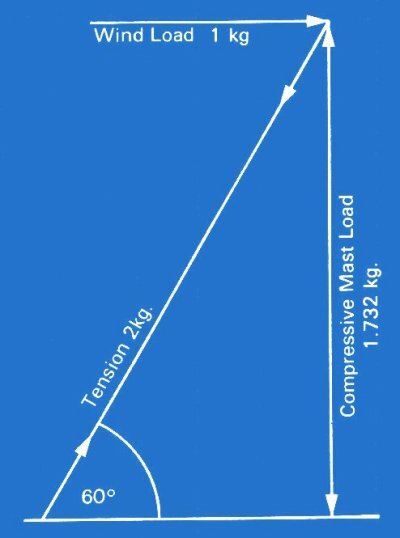 Phase 2 Series General information on Phase 2 Series portable masts, which includes the PT, YT, WT and XT ranges, all heavier duty masts. PT Series The original Clark Portable Telescopic Masts, Headloads up to 36 Kg and extended heights to 21 metres. 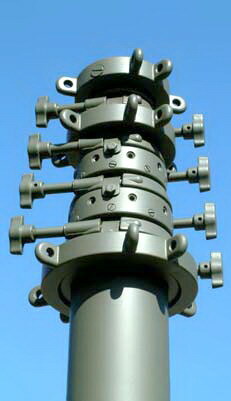 Keyed mast sections. All use 114 mm (4.5") diameter base tubes. YT Series General Purpose Portable Telescopic Masts, Headloads up to 30 Kg and extended heights to 15 metres. Keyed mast sections. Uses 127 mm (5") diameter base tubes. WT Series Middleweight Portable Telescopic Masts up to 30 metres, Headloads up to 130 Kg and extended heights to 30 metres. Keyed mast sections. Uses 152 mm (6") diameter base tubes. XT Series Most Powerful Clark Masts in the range, Headloads up to 150 Kg (specials to 300 Kg). Keyed mast sections. Heights to 18 metres. Uses 203 mm (8") diameter base tubes. Mast Guying Options A range of mounting options are available for all Clark Masts portable pneumatic telescopic masts. Also just applicable to these masts are a number of guying possibilities. This catalogue page covers both the above. Accessories Various Mast Accessories for Clark Masts portable telescopic masts including Vehicle, Shelter and Field Mounting Assemblies, Roof Trolleys, Guying components etc. Mounted Series An alternative to vehicle mounting, Clark Masts Trailer Masts with Headloads up to 55 Kg and extended Heights to 30 metres. Based on the WT Mast Series. 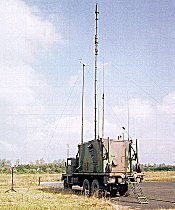 Rapidly deployed portable telescopic masts. Series Based on the XT Heavy Duty Mast Series. Extended Heights to 30 Metres Maximum Headloads to 80 Kg. 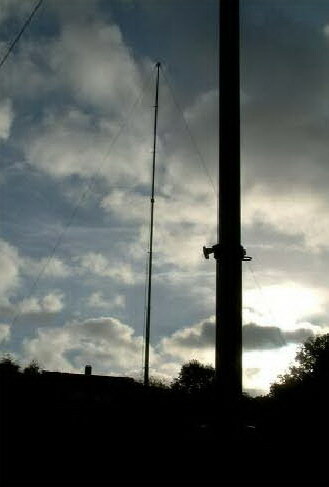 Rapidly deployed heavy duty portable telescopic masts. Contents Page Rugged air-operated or manually extended masts always ready to use, including the TekMast, Surveyor Field Mounting Mast Kits, Type PU Manually Erected Mast Kit, as well as SCAM, Series 90, Type 73-S and Type 73 mast kits. Contents Page Teklite is Clark Masts Portable/Emergency Lighting Mast Series. Teklite TF-200E, TF-300E, TF-400, TF-500, TF-600, TF-700, PLU1 and Teklite MLU lighting systems. Clark Masts portable telescopic masts are at work wherever there are people. 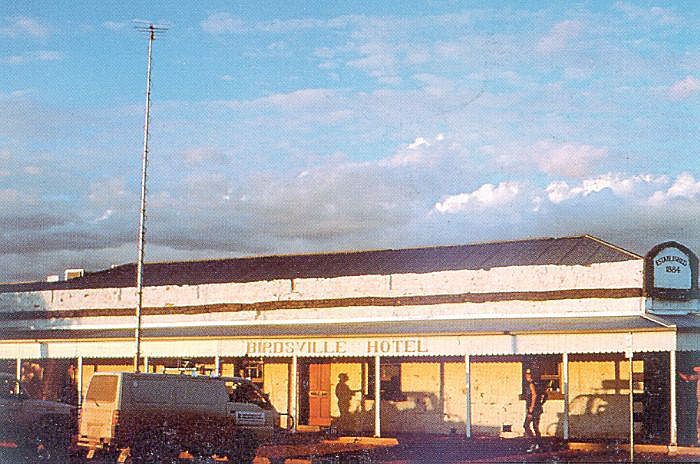 Like Australia's famous Birdsville Pub in the middle of the Australian Outback. With portable air-operated masts available for heights up to 40 metres and capable of lifting headloads up to 300 Kg, their is a Clark Mast portable telescopic mast for most applications.